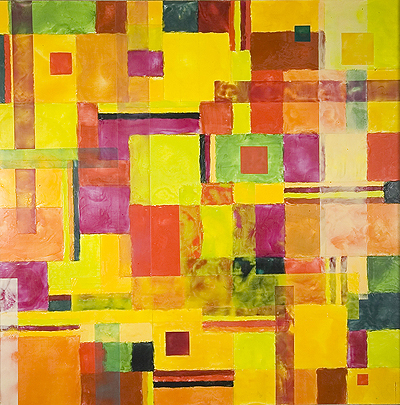 "Order Harmony", Encaustic, 48" x 24"
The formal exploration of design and color comprise this series. 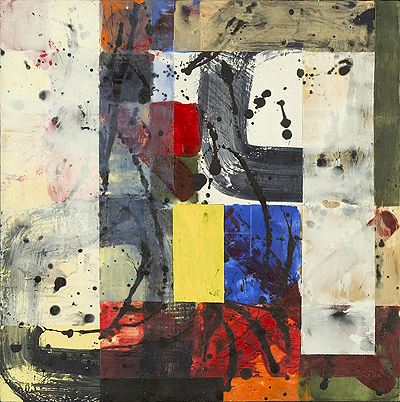 The paintings juxtapose geometric bands of color with painterly gestural marks. While the artistic process is similar, the inspiration is diverse - sometimes the natural world, or music or Arabic calligraphy. "Rhapsody 1", Encaustic, 20" x 20"
"Fall 2", Encaustic, 40" x 40"
"Venice", Encaustic, 48" x 24"
This series developed from memories of my travel to Italy. I remember the feeling of awe upon entering the Piazza del Duomo in Florence - the magnificence of the architecture, the sense of space and my place in it. Similarly, in Venice I responded to the fluid, watery beauty of this unique city and its opulence, rich in history and intrigue. In Venice, reflections are never what they seem and mystery prevails. In this body of work my aim is to convey a sense of mystery and a suggestion of timeless drama.